Lead forms can be posted to any page on your organization's website, to encourage new email newsletter signups or track other interests. To start creating a new form, navigate to the Forms page in Virtuous Marketing to get started. The Forms page will have two options at the top of the screen, for Donation Forms and Lead Forms. Select Lead Forms to view any forms that have already been created. To create a new form, click on the ACTIONS button in the upper right and then select "Create a Lead Form." To begin, give your new lead form a name. The name will be your only identifier for this form, so it needs to be unique. 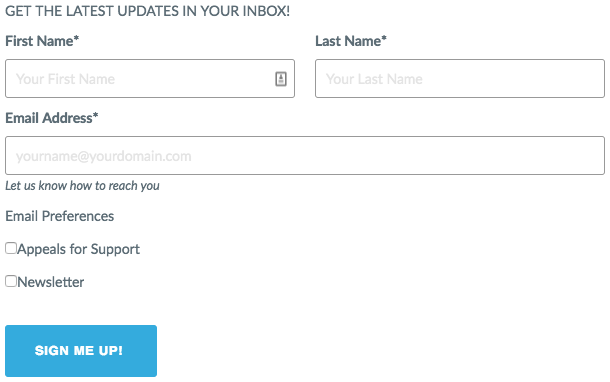 Instead of just calling it "lead form," be as specific as possible, like "Newsletter Signup Form for Year-End Blog CTA." Or, heck, name it "Jim-bob" or "Dolly," if you want to. So long as the name is unique, you're all set. 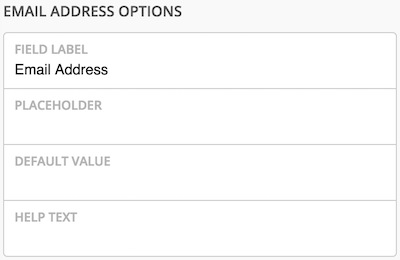 In addition to a name, you'll have the option to select a default value for the Origin Segment. Each Contact in Virtuous has an Origin Segment, which allows for tracking of acquisition metrics related to any Campaign. Once your form has a name and you've selected a default Origin Segment, click NEXT in the lower right to move on to the Build screen. On the build screen, you'll see that a default form has already been configured, with some of the more common fields included. If you like, you can use the default form as-is; simply save and publish your form to use it in your site. If you'd like to make changes, you can click and drag to rearrange the form fields however you like. Click and drag any additional fields from the left side of the screen to add them to your form. Click on the trash can icon on any field to remove it from the form. Some fields, like First Name and Email Address, will not have a delete icon as they are required and cannot be removed. Use the Default Value to pre-fill any form field with a value of your choosing. This can be particularly useful when applied to custom fields that need to be captured with data from a specific form. Help text will display below any form field in italics, as shown in the above example. Use the "Field is required to submit form" option to make any field a required field. But keep in mind, it's important to balance your needs for data with your prospects' experience; too many required fields can add time and frustration and may keep some people from completing your form altogether. Use the "Field is hidden" option to hide certain fields on the form altogether. Used together with a default value, this makes it possible to capture specific custom fields or other data that prospects may not need to fill out. For example, you may have a custom field called "Interest: Disaster Relief" used to track donors who may be interested in giving to disaster relief projects. You could populate this field by default for anyone clicking on a form that is embedded on your web page devoted to hurricane relief efforts. This value will be passed through and stored on the created Contact. 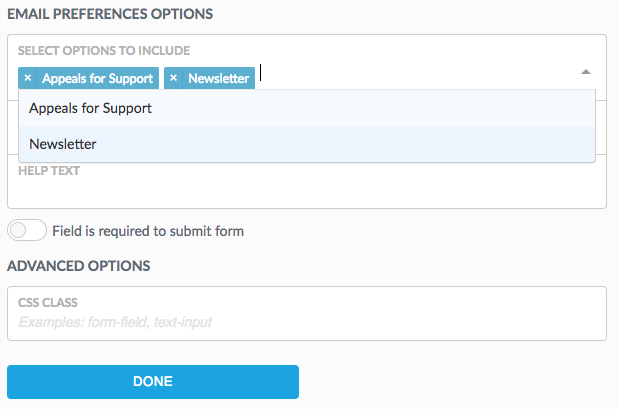 One of the fields available to be added to a form is the "Email Preferences" field. use this field to allow site visitors to join any of your existing Email Lists. Click edit to select one or more Email Lists to include in the form. Each list will display in the final form as a checkbox, allowing site visitors to select as many as they would like. Use the "Field is required to submit form" option if you'd like to require visitors to select at least one list in order to submit. Once you have made changes to your form, select the "Preview" option from the Actions menu in the upper-right area of the screen to see how your form will look once you add it to your web page. 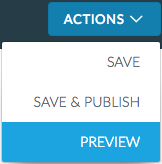 The preview will include any edits, help text, and custom instructions you have added. From the Actions drop-down, select "Save" to save your changes. In order to use this form on a web page, you must be sure to select "Save & Publish." When you have finished editing your form, be sure to save your work, publish the form, and click NEXT in the lower-right to move on to the next step. Once someone successfully fills out a lead form, you can determine what should happen next. The default option would be to create a thank-you message that will display on-screen once a visitor clicks SUBMIT. Use the editing toolbar to customize your message. Alternatively, you may choose to have the form redirect users to another page on your site, where you have additional content to display. Below these options, users will see the option to select a Form Confirmation Email to send as soon as a form submission is received. Click here to learn more about Form Confirmation Emails. Once you have made your selections, click on NEXT in the lower right to continue. Now that you've created your new form, it's time to put it on your site! Click on the Copy button to copy the displayed code snippet to your computer's clipboard and then paste it directly into your web page editor. If you are not the web designer for your organization, just click on the "Email to Your Web Developer" button to send an email containing the code snippet directly to the correct person. You'll be prompted to enter an email address, and then a pre-formatted email will be sent directly. Once your lead form is live, form submissions will automatically generate a Contact Import, which should be visible on the Gift & Contact Import page each morning. Process these imports to create new records and update existing records as needed.